For some time, there has been a debate about the safety of cell phones and smart meters due to high frequencies produced by these devices. 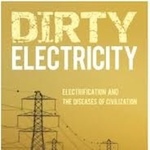 Dr. Sam Milham speaks with Jason Hartman about his book, Dirty Electricity, and how anything that interrupts the flow of electricity causes dirty electricity. Dr. Milham contends that, based on his research, mortality rates increased as more and more residents of urban areas were joined to the electrical grid, including risks of cancer and diabetes. He shares some research, including an increase in cancer in a school, dairy cows not producing milk, and more that led to the discovery of high frequency electrical pollution that was causing an increase in a variety of problems and diseases. Not all electricity is dirty, but anything that produces high frequency waves, such as smart meters, certain appliances, cell phones, digital handheld phones, compact fluorescent lights, solar energy, WiFi, and more, contributes to higher rates of cancer and even obesity. Dr. Milham suggests ways to eliminate dirty electricity in the home. For more details, visit: www.HolisticSurvival.com. Dr. Milham is a specialist in occupational epidemiology and is known as the scientist who first alerted the world about the frightening link between occupational exposure to electromagnetic fields, electromagnetic pollution, and human disease. Dr. Milham is a graduate of Union College and Albany Medical College. He became a Senior Resident in Epidemiology at the New York State Department of Health in 1961 and then was a development consultant for the department. His experience includes Associate Professor, Department of Pediatrics, Albany Medical College; Associate Professor, University of Hawaii School of Public Health and Medical School; Section Head, Epidemiology Section, Washington; Chronic Disease Epidemiologist, Washington State Department of Health, and more. He has received many awards and has written numerous articles on various medical issues. His mortality rate studies led to the writing of his book, Dirty Electricity, to alert people to the possibility of a looming epidemic of morbidity and mortality due to high frequency radiation, and what steps to take to reduce our exposure to dirty electricity. Guest: Dr. Samuel Milham, M.D., M.P.H.